I think I didn't realize how long it has been since I've worn pink until I put this polish on. My taste in polish has changed so much from these sweet shimmery polishes to the dark vampy ones and everything in between. However, I do think that they all have their place. This was like a breath of fresh air. Such a sweet color! How do you feel about colors like this? I have a feeling this may partly be due to the fact that the plates are warped, but here is where I need your help... those of you who have the Red Angel plates... do yours look like this??? I would like to know if all Red Angel plates are like this or I got a bad batch. I don't want to go thru the hassle of a return if they are all like this... please help! 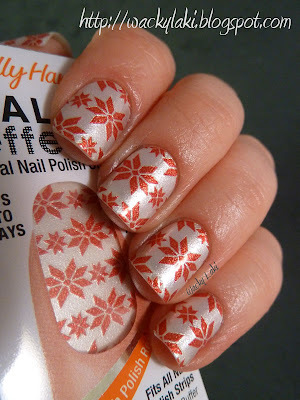 My only prior experience with nail strips was that with the nail foils from The Born Pretty store here. They looked nice, but I couldn't stop picking at them and they came off in less than an hour. After that I have been mostly ignoring anything that resembled those nail strips and assuming they were all the same. As luck would have it, I won two packages of Sally Hansen Salon Effects as part of Carolina's amazing giveaway. One of them is this one, named Snow Bunny. Since I needed a break from the dark colors I have been wearing lately and these have such a cute holiday design, I decided to give them a try. Overall, they were easy to apply, contoured to the nail well and didn't lift or peel as the nail foils. I was not at all tempted to pick at them and more than 24 hours later they still looked great. It was actually kind of sad when I removed them. I would definitely wear these again, especially for a trip where I don't plan on changing my manicure on an almost daily basis. 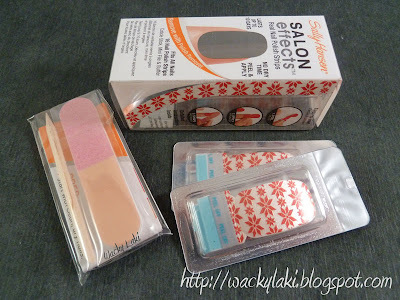 The package contained 2 blister packs with nail polish strips, a nail file, cuticle stick and detailed instructions. I didn't bother looking at the detailed instructions and the simple ones on the box were enough. Have you tried nail polish strips before? Love them or leave them? 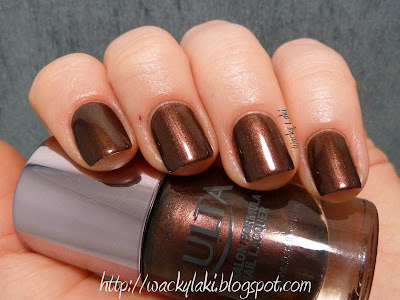 What do you think of brown polishes? I wanted to show you my fun Chanukah manicure that I have been wearing over the weekend. 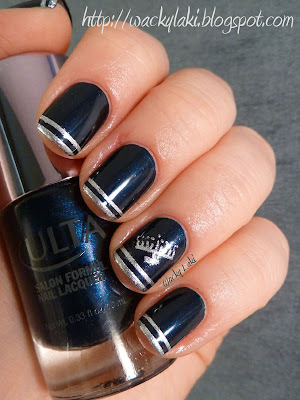 I just love the combination of dark blue with silver. I do wish the blue was a bit lighter, but on the other hand it did make quite a pop. Below are swatches of Wild Night on its own. I used two coats plus a top coat in these photos. The formula is a bit on the thicker side, but I didn't have any problems with application. Two coats for full coverage. 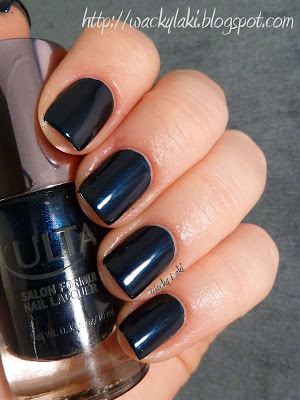 A gorgeous navy blue with a blue shimmer. 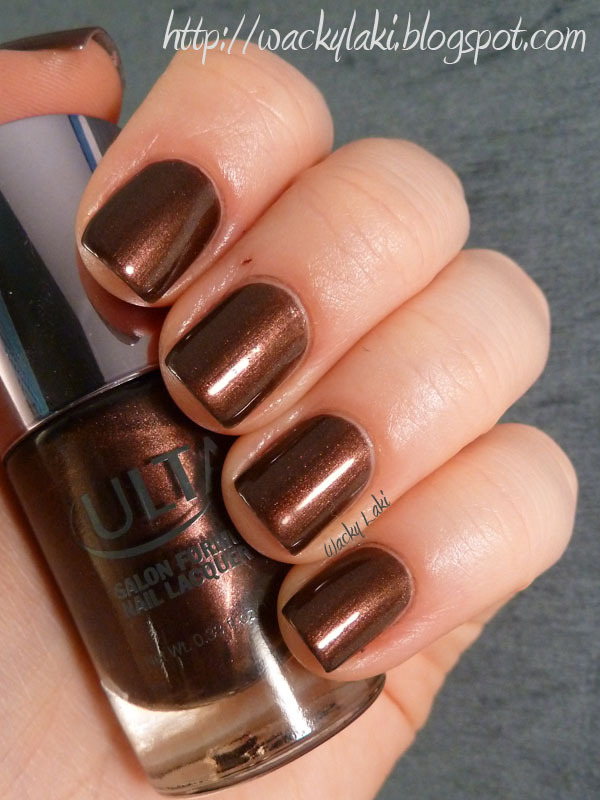 The shimmer does hide with no direct light and after a few days of wear the polish seemed to get darker. Maybe that was just my imagination, but after 3 days of wear I could barely see the shimmer and it looked almost black. 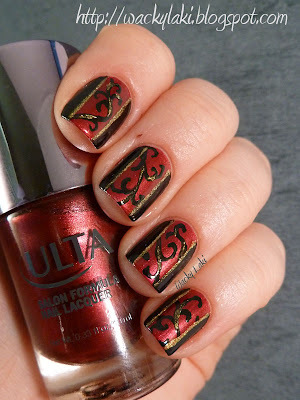 This manicure reminds me of wrapping paper, although traditionally I think it would more likely be red paper with gold print. I do like how it looks in reverse with gold as a base. For this, I started out with two coats of High Roller, followed by stamping using Bundle Monster plate BM-206 and Ulta Ruby Slipper. Here is what it looks like on its own, a beautiful champagne gold foil. 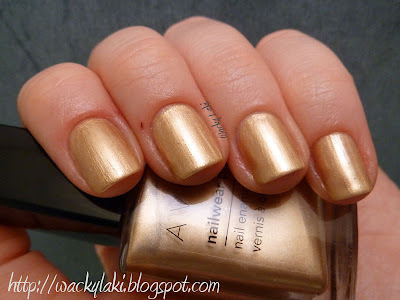 The polish is made up of tiny gold and silver particles (just in case you like to analyze polishes as much as I do). 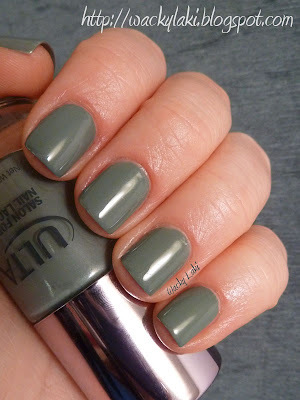 It reminds me of Nicole by OPI - The Next CEO. I don't have the polish to do a direct comparison, but I'm sure they are close. What do you think of this color or the foil trend in general? 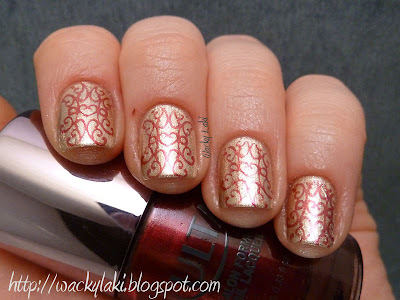 I love how well they work for stamping! 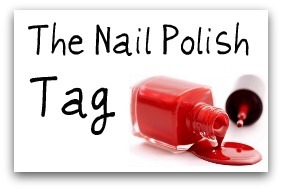 Leslie of Polish Art Addiction tagged me with The Nail Polish Tag which I cannot pass up! 1. Answer the 10 questions. 2. Pass this tag to 5 other bloggers. 3. Make sure the bloggers that you tagged, knows that you tagged them, by sending them a comment on their blog. 5. If you're going to have a nail polish line, what are you gonna name it? Wacky Laki... just kidding. I don't plan on producing nail polish so thinking up a name just seems silly. 6. What nail polish color does not compliment you? Yellows and oranges are very hard colors for me to wear. For now I would say my nail art friend is Fran from Francirocks. We developed a friendship while doing the swap. 9. 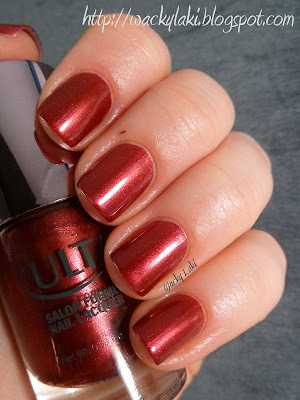 What was the best nail polish gift you have ever received? Every time I have won a giveaway has been like a gift. I'm amazed by people's generosity and am always so greatful! Of course I'm also thankful for fun unexpected gifts like the one my cousin gave me here. 10. Make a speech about thanking the blogger who gave you this tag. I would like to thank Leslie of Polish Art Addiction for tagging me with this. Her art is such an inspiration to me. Make sure to check her blog out! Thank you so much Leslie! I have been slacking on posting (or doing) any nail art lately, so I thought I would do some today. 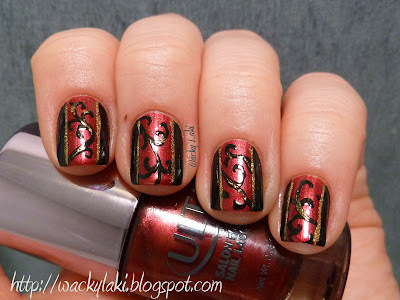 I started out with Ulta Ruby Slipper and added freehand swirls plus a border using black acrylic paint. The gold accents were done using Sinful Colors Nail Art in Flower Girl. Here is Ruby Slipper by itself. A shimmery red with just a hint of maroon. Application was great with two coats for full coverage. Swatch photos taken with a top coat. It is slightly darker in real life than the photos show. Closer to the color on the index finger or the bottle. 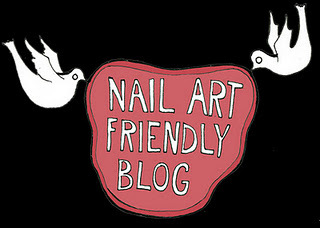 Nail Art Friendly Blog Award! I would like to pass this on to some bloggers whose art I admire very much! 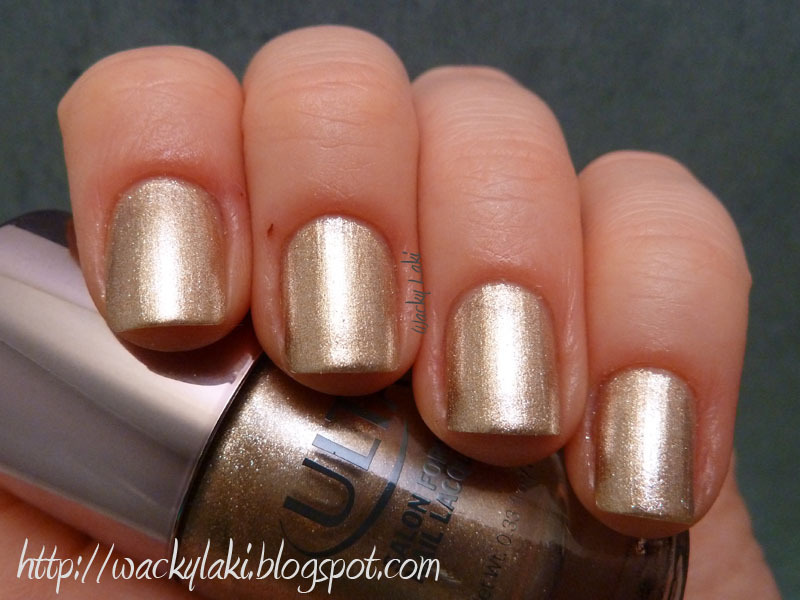 In the bottle, Gleaming Gold appears as a foil with very fine particles so I was surprised when it didn't apply like one. The formula is somewhat prone to streaks and requires a very light application. This was not too much of a problem since the slightly widened brush is very easy to work with. It was fully opaque in two coats, although I can see a bit of the nail line in these photos. 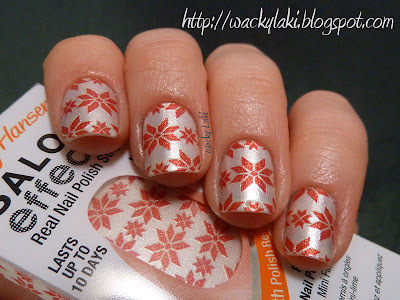 What do you think... save it for stamping or wear on by itself? I have been wearing a lot of purples lately and even though I love them, it was time for a change so out came an army green. This one is called Army of 1 from Ulta's Salon Formula line. I have had an obsession with this color for quite a while now and have accumulated a few polishes from different brands that at least in the bottles all look like this one. I will try to compare them at some point. 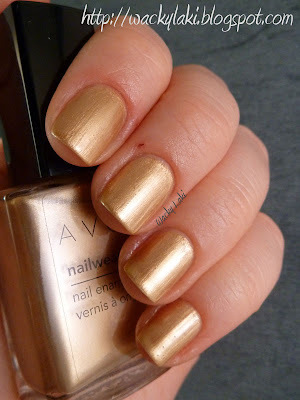 I like the color, but once I had it on as a full manicure it just seemed to be missing something... a little spark. Maybe that is because I have been wearing a lot of shimmery polishes lately and the cream finish of this seemed boring, but I decided to spice it up. 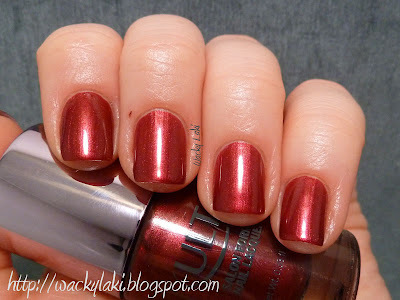 I chose to use a polish I have had in my collection for a long, long time, but have not used recently because is so sheer (and I have only recently discovered the magic of layering polishes). Sadly I have no name for this polish. The brand is Prestige about which I also have no information. I'm assuming it either came in some sort of set or dollar store maybe. If anyone has info on this brand please let me know. Trying to google "prestige nail lacquer" is useless since I come up with all the brands that are "prestigious". It reminds me of the "effect" polishes that are so popular right now. Are you a fan on the layering trend? P.S. 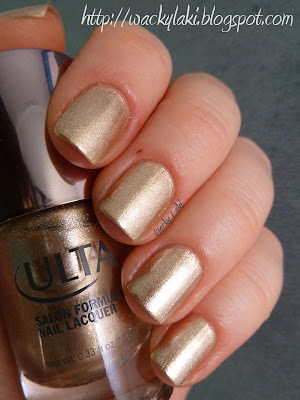 I'm trying to swatch all my Ulta polishes right now because of the requests in the haul post, but I would like to know if you get tired of seeing the same brand day after day and want variety, or if this is good. Your comments are greatly appreciated!